"Abba-Abba, you wouldn't believe it," my boys breathlessly told me, a couple of years back, after a long day at cheider. "The kids say they have an answer to Hollywood!" "Now why would they be thinking about THAT?" I asked, incredulously. "Oh, you'd be surprised. They know what's out there. And they know we must combat it. 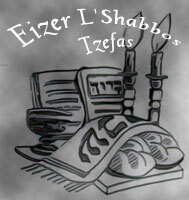 But now they've got a great slogan for doing so…"
N- Nishmas (a major Shabbos morning prayer)!!" There's no question that action is what makes the world go round. It's just a matter of the dimension in which it's taking place. While some outsiders see the Chassidic lifestyle as repellant to "the good life", the truth is that we're very intensely seeking it – just within a very different dimension. At the core is Shabbos. (…) Thus is explained the matter of saying Hodu with the oncoming of Shabbos. For within it are expressed the deepest Jewish susurrations concerning the four types and forms of crisis, materially and spiritually, within which he is absorbed during (the week), which peaks at the time of Shabbos eve wherein he feels utterly incapable of opening his mouth in prayer except for screaming out the simplest of screams! (…) And so the verses of our psalm develop and allude (… The highest of these sighs) being rooted in the craving, longing and pining for G-dliness (…) This is the sigh of Shabbos itself, emerging from the overwhelming feeling of the sweetly delectable, supreme delight of holy Shabbos. (…) About this sigh we say in the Nishmas (prayer): 'To the languish of the paupers You hear; to the scream of the downtrodden You listen and deliver'. 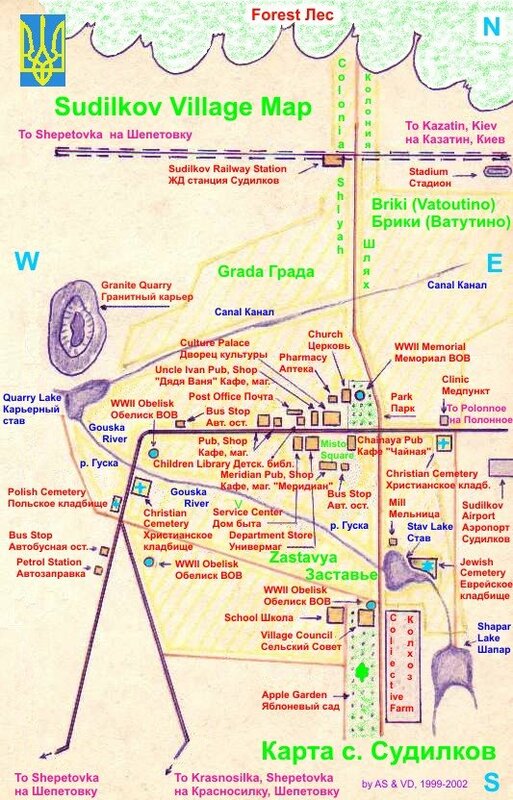 So we gain a little insight into the "Akshn" of Slonim. It's all about tapping into the deepest soul pang which, when expressed with an entire community of kindred souls, is unbelievably cleansing and uplifting. The fact that people come from nearly all walks of life, every week, to partake in the leil Shabbos Tisch (festive table), tanz (dance) and zitz (quiet "sitting" and singing, in this case within a totally dark dining room) that follows speaks volumes for the holy action that is taking place. Yet the general idea is not unique to Slonim. There are more than a few other Jewish communities in the world who tap into this same font of holy Shabbos action. Still, Slonim maintains a fine difference which I dare say goes all the way back to the beginning of the chossidic movement. Rav Aharon Ha'Gadol from Karlin and the Maggid from Mezritch were two of the most outstanding disciples of the Besh"t. Both were known for their extremely intense preparations for holy Shabbos. Legend has it that once the Maggid sent a messenger to Rav Aharon, living in a completely different town, to ask him to stop saying the Song of Songs with such intensity on erev Shabbos since the way the heavens shake when he does so wakes him up from his sleep! Now you've got to pay close attention to this: Even though Rav Aharon's praying was so real that it affected the Maggid's sleep in a completely different town, the Maggid nevertheless deemed his sleep was more worthwhile!! For the rest of us, of course, there's no presumption of judging another's Shabbos actions. There are those who do it quietly and those who do it with a bang. The main thing is to pour your whole heart and soul into it. Indeed, as we've learned, Slonim's orientation is to finely balance. So too you'll find in the central Slonimer Shul in Mea Shearim that with candle lighting, as the Rebbe enters, the atmosphere is charged with something akin to a giant, restrained scream. By the time the after-meal Tisch occurs and the niggunim finally burst forth, in full glory, the air is so thick with a mixture of teshuva and oneg that you feel as if you're in a spaceship hurdling into nowhere and everywhere at the same time! In contrast, if you'd enter the Toldos Aharon or Karliner Shuls down the block, you'd find much more vociferous excitement. Both bodies and voices are moving light years faster than Slonim could ever dream of, clearly at the head of some sort of cosmic race! There was a wedding a few years back between a couple related to the Rebbes of Karlin and Slonim. The Kallah's side was Karlin and so the chuppa took place in their courtyard. 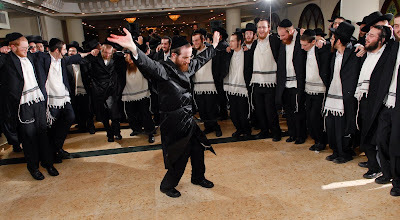 The pre-chuppa Tisch and main dancing took place by Slonim, a ten minute walk away. The difference in energy between those two worlds in such close proximity was utterly mind boggling. To this day I still hear Slonimers recall the daze they felt by the speed with which the Karliners set up the bleachers and how sport like it seemed that they cheered their Rebbe during the Mitzvah-tanz. The Karliners I met say they can never forget the piercing intensity of the niggun we sang for our Rebbe's tanz. A young Karliner once told me that it's striking how the three chossidic groups from Lithuania all daven so differently: Lubavitch whispers, Karlin screams and Slonim does a little of both! Which brings me to a final comparison. I call this last community Modern Orthodox though I'm sure there are plenty who would prefer to subdivide this scattered, Rebbe-less folk based on various ideologies and dress. As far as I'm concerned, however, this is one large community of all those who are concomitantly devoted to Torah Law and modernity; whose source of action is found in both worlds. The fact that they also need to balance is something that naturally engenders affinity with Slonim. My main reason for comparing them, however, goes much deeper. There is a very real phenomenon of learning the Nesivos within the Modern Orthodox world today. While it's remarkable enough to have one, contemporary seifer learned so extensively amongst different chossidim (the Pitsburger Rebbe calls it THE weapon against our generation's Yeitzer; the Belzer calls its author "the professor of Chossidus" and has ALL his cheidarim learn it, daily! ), it's truly revolutionary to see such an attraction amongst the Modern to one of those "fanatical" chassidic texts. In fact, throughout the entire world you can find chaburas of Baalei Teshuva, Litvische-lite, religious Zionist and even Sefaradim with set sedarim (schedules) for learning the Nesivos – or what some may call the Netivot! I know this from many reports and also from my own, brief globe trotting. Undoubtedly it has something to do with its exceptional written style. There's nothing quite like its fluid, poetic and yet totally unpretentious Hebrew that allows for those who struggle with classic Jewish texts feel like THIS is one Torah ocean in which I can swim. Still, that's not what keeps them coming back. Rather, I think a key can be found in what I learned at the end of my first meeting with the Nesivos, back in 1995, which was one of his last meetings with "outsiders". I had mentioned that I was about to start teaching an extra curricular Jewish philosophy class for secular Israeli high school students. You know – the virulently anti-religious types. Although I had originally planned on including some excerpts from his sforim within the handouts, after having just been ignited by his world of pristine holiness I was beginning to think that it would be an utter travesty. 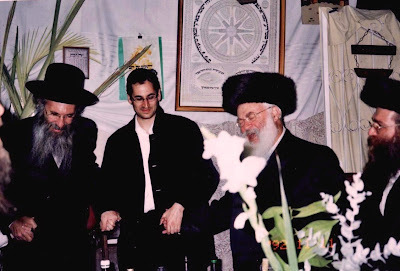 "Would the Rebbe agree to me using his teachings in such a secular environment? ", I asked, totally prepared to abandon the plan. "For WHAT ELSE did I write it! ", he exclaimed. Now, in retrospect, I imagine there are quite a few answers to that question. Back then, however, all I could think about is that this seifer was so pure that NO one could pull it down. Indeed, the most striking fact I've learned in the last decade of observing the explosion of the Nesivos's popularity is that EVERY one comes out a little finer and deeper. There's always a "pshhhh" and "auh!" shining straight out of the heart, energizing every limb with a brand new commitment to joining the holy action of serving our Father in Heaven, may His great name be blessed. Still, there's something else. It's hard to put your finger on it. It revolves around the fact that you'll never find a single Slonimer trying to persuade a single one of these fine yidden to join the community. Nor do they try. Yes, THAT's the kind of question that pulsates throughout the Nesivos and bonds Slonimers with M.O.'s. For it drives home the Talmudic truth that we all hold so dear (Sanhedrin 106B): Rachmana liba boee, the Compassionate One wants first and foremost the heart. The purely Jewish heart that is always beseeching, Reb Mitzvah – where's the Ohr! Thanks, Rabbi Bar-Chaiim--in this post you answered my question about the last one, regarding modernity. Thanks for the inspiration. I plan to learn the Nesivos, too. 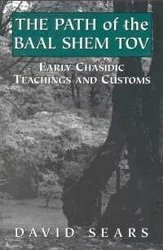 1) R Aharon haGadol was not a talmid of the Baal Shem Tov. He met him when he was a small child. Rather, he was the Magid's talmid. 2) The screaming by davening originates from R Shlomo Karliner, the Rebbe of the Lechovitcher. The derech in lechovitch and of the Kobriner as well was a loud davening. I was told that the Nesivos Shalom was the one who put an end to this. I imagine this is easy to find out. also interesting whether the shvartze Slonimers (the other sect of Slonim as they are called) yell. 3)that maaseh with Rav Aharon haGadol, some say it was Friday night, not Erev Shabbos, and he also probably slept to prepare for Shabbos as it is brought from his talmid, R Shlomo Karliner that one needs to be moser nefesh for 3 things Erev Shabbos, one of them being taking a nap. Not sure how this proves a quiet Shabbos in Slonim as they originally come from Karlin. Thanks for this eloquent "crash course" on Slonimer Chassidus, Rabbi Bar-Chaiim. I davenned with the "Shvartze Slonimers" in Borough Park on Shabbos for a year or two during the early 1990s and found the davenning very congenial. A long, meditative, introspective but vocal Pesukei D'Zimra, flowing into a very focussed Birkhos Kriyas Shema and then a lengthy Shemoneh Esreh. Everything else moved along at a good clip. The niggunim were kind of "dark," as I recall -- quite different in mood than those of Chabad, Karlin, and Breslov. But powerful. It was a nice chaburah, although I had already found my niche in Breslov. thanks for the beautiful insights! can you refer me to any Slonimer nigunim resources on the net? what are the schvartze slonimers? whats the difference? Thank you for this series. I find it to be incredibly inspiring. Shalom to everyone. I'm sorry I'm lagging behind in my responses, but I've just entered a very demanding schedule. And I guess I also feel the need to counterbalance all that pc time I put into those posts! So the plan is to jot a few thoughts here, for this week, and then get to the earlier ones next wk, iy"H. If anyone wants a more personal dialogue, pls feel free to email me (via ASJ). Yehonasan: I'm very pleased I could answer a question of yours. The Nesivos would often speak of YESHUV ha'daas and BEHIRUS ha'daas in one's personal life as important means for achieving Daas H', in the pure dveikus sense. I think answering these kinds of questions is definitely apart of that process. Our Bilbul (confusion) about how the different drachim interlace often can derail our spiritual lives, H' yishmor! 1) %100 abt R' Aharon. I meant that they were both considered as the next generation after the Besh"t. I think the Alter m'Lubavitch, for instance,is firmly in the generation of the talmidei Ha'Maggid, in contrast to R' Aharon. However, I confess I am NO bakee in chossidic history. 2) I brought that story abt R' Aharon to suggest differently. I've never heard that Lechovitch-Kobrin had a DERECH of loud davening, though clearly the Beis Avraham and his talmid muvhak, the Nesivos, slowed things down.As for those who broke away from Yerushalym Slonim, they distinguished themselves in general by emphasizing chetzonius (external religiosity). I believe the style of davening in Lubavitch comes from the Mitteler Rebbe, son of the Alter Rebbe, who expounded on this topic at length. I can't believe I forgot to mention this - especially since I just brought up Lubavitch. Today was the yahrzeit of Rebbetzin Menucha Rochel Slonim, daughter of previously mentioned Mitiler Rebbe and grand-daughter of the Alter Rebbe. I imagine she married one of the Slonimer Rebbeim. Could you enlighten us with some history? is the slonimer's sefer available in english or hebrew-english? thanks, Rabbi Sears do you have a blog of your own? im a big fan of your books. any plans to visit SA? Sorry, no blog. I did a lot of work on www.breslovcenter.org over the years, but aside from an occasional posting on ASJ, I'm winding down on writing and going back to painting again. Thanks for the chizuk, though. As far as traveling goes, the Uman trip is just about the only one I make anymore. Maybe we'll meet there one of these days! R' Dovid Sears – thank you for the compliments. I do appreciate it from someone who has done so much of this kind of teaching already. In fact, I'd love to consult with you over my book, if you would have some time. Please contact me through ASJ if you or someone else you know would be interested in helping it see the light. Re. the "dark niggunim", I must first stress that the "Shvartze Slonimers" are now considered (at least by the Viesers) as a VERY different community. It wasn't just the beards that distinguished the Rebbes! Did you ever hear anything over there, btw, re. a history with Breslov? Secondly, heavy, heart-wrench within Slonimer niggunim is definitely one of its distinctions. It's not meant to entertain but "break" the self from all pretenses and relearning the Ohr. Tea M.H. – thanks for the enthusiasm! I'm so sorry I can't help you access some niggunim. But then again, I can't stress enough that in Slonim experiencing is so much better than observing. It's simply a derech that demands your inner growth. Chanie & Menashe – thank YOU. Knowing that I'm helping my Rebbe's touch others gives me much nachas. Probably more than you can know. Re. the Lubavitcher-Slonimer Rebbetzin, I think I've heard something like that. Doesn't surprise me. Lub's and Slonimers have a lot of overlap. The Nesivos was even R. Yeshiva in a major Lubavitch Tel Aviv Yeshiva for 2 years til he left to rebuild Slonim after the war. I have a releative who belongs to Shvartze Slonim. They, at least, don't consider their difference with Veiser Slonim to be only in chitzoniyus. They are very much Slonim-like in their emphasis on pnimiyus'dike avodah in contrast with other Chassidus'n. However, they don't make a specific avodah of being anti-chitzoniyus, as the Nesivos Sholom seemed to have done. As R' Dovid pointed out, they consider themselves "traditionalist", and try to follow the old Slonimer mesorah as they feel that they were mekabel without innovations. I think you zoomed in pretty well. The Nesivos was definitely "innovative" in his emphasis on Pnimius m'al ha'kol, in contrast to the "traditionalist" camps. However, it was not in the sense of change but of reemphasis. If you study his writings you'll see that he made a constant, powerful case that THIS was the Mesora! It was simply more subtle back then, perhaps because the pnimiyus was more palpable within general Yiddishkeit. As I briefly brought, the Lechovitcher (and in a way, R' Shlomo Karliner before him) was very big on making the Ohr of Mitzvos a foundation for the average chossid and not just a lofty ideal, and certainly not something exclusive for the Tsaddikkim. Shabbos and shmiras ha'Bris were for him crucial conduits for making the Ohr permeate one's entire life. It was understood that chetzonius was a relative implication; a mere means for buffering the pnimiyus. The Yesod Ha'Avoida went further in pounding into the velt that Torah learning must follow a similar course. The Beis Avraham, of whom Nesivos was a talmid muvhak, sent the latter to Israel to davka reignite the sparks of pnimiyus that were dissipating in the tough spiritual environment of Tiveria. Whatever way you cut it, the extraordinary popularity of the Seifer Nesivos Sholom is due to his emphasis on pnimiyius m'al ha'kol. Perhaps at a latter time I'll share some more stories and insights about this. to experience first hand will be a little difficult for me, as there only Chabadnicks in my neck of the woods. (couple of us Breslov lovers). i have a friend who is a "litvish" rabbi, who has learned some Slonimer chasidus, and described it to me as cool, soothing waters of Torah. funnily enough he doesnt prescribe to any Chassidus. i would really love to be exposed to more Slonim. so keep it coming!